I just learned today that if all goes well, I should have a reason to go to Buffalo on Monday. As I mentioned in my last post, I have been planning to stop by the Larkin Administration Building site for some time to photograph its last remnant. I wanted to make sure I knew where it was, however, so I did a little research. The Larkin Administration Building was designed by Frank Lloyd Wright in 1904 and completed in 1906 to house the offices of the Larkin Soap company. (The huge factory buildings adjoining the offices still exist.) The building was the first office building to be air conditioned. 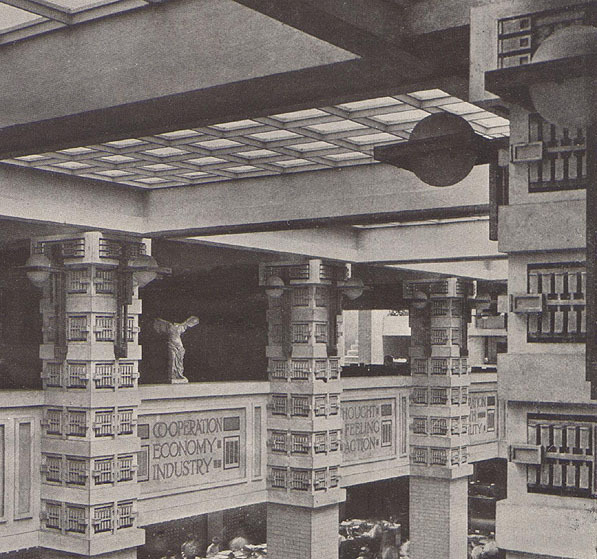 If you’ve ever been to a building with a multi-story atrium that provides natural light from above, you’re looking at the legacy of the Larkin Building. Its interior was what was so revolutionary, especially when it was built. 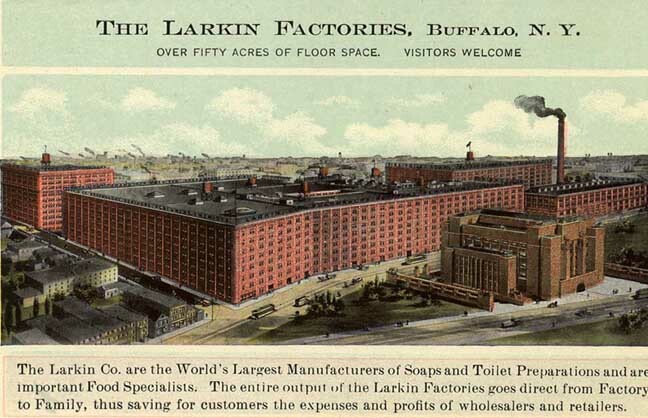 Just as the Depression was not kind to the Darwin Martin family and eventually resulted in the abandonment of the Martin House, the affairs of Darwin Martin’s employer, the Larkin Soap Company, were also in dire straits. The Larkin building was transformed into a retail store in 1939, but sold in 1943. Eventually the building entered foreclosure and was abandoned. 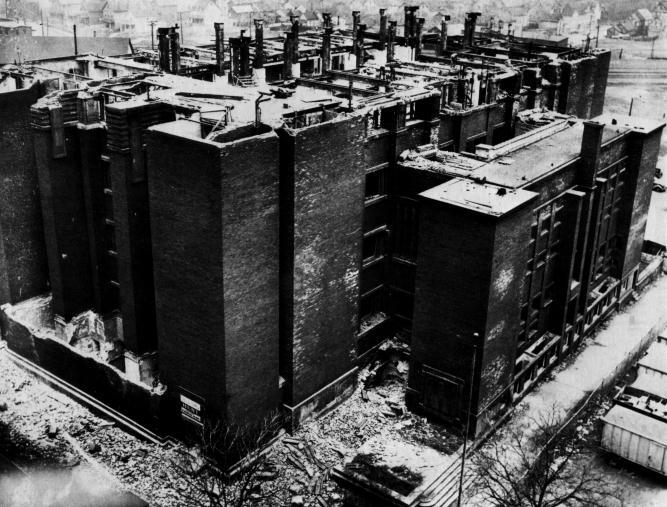 The City of Buffalo attempted to sell it several times and considered a variety of alternate uses, including government offices and a recreation centre, but in its abandonment the building was deteriorating. It was eventually sold for a mere $5000 and demolished in 1950. It apparently was a major pain to tear down–it was very well-built. If you head further west along Swan St. in Street View, you can see the remaining fence pier (it was part of the fence that can be seen at the back of the postcard of the offices and factory above) This will be what I’ll be visiting next Monday.